Finally… here the Stage 8, the last one! After 7 days of hard running averaging more than 34km per day, this last day is relatively short with only a couple steep valleys. After ascending through a quiet forest path – reminiscent of the pine forest encountered way back on day 2, we come to an old road that once was a main link between upper villages on this section of the mountain, but is now rarely used. The road is wide and smooth and we can run at a steady pace. Where the trees clear we are treated to gorgeous views off the mountain to the south. After a few kilometers, we come off the road and Simon leads us up a narrow path which suddenly comes to a ledge 10 meters above the road and houses below, and is the highest drop-off and scariest 30 meter section of the whole 8-day KSR! From there It is a long steady uphill. Relax, take it easy and walk if you wish – it’s the last day! We then cut across a very pretty section of grassy knolls interspersed with scrub brush and pockets of trees – yet another completely new running environment! This bleeds into a path that runs in the open land between the forest and village gardens. Shortly after mid-day we begin to enter more familiar territory as we reach Marangu Village and pass above Simon’s Mbahe cottages. But … as you must complete the circumnavigation, you have to continue the extra 2 kilometers to the Marangu gate. 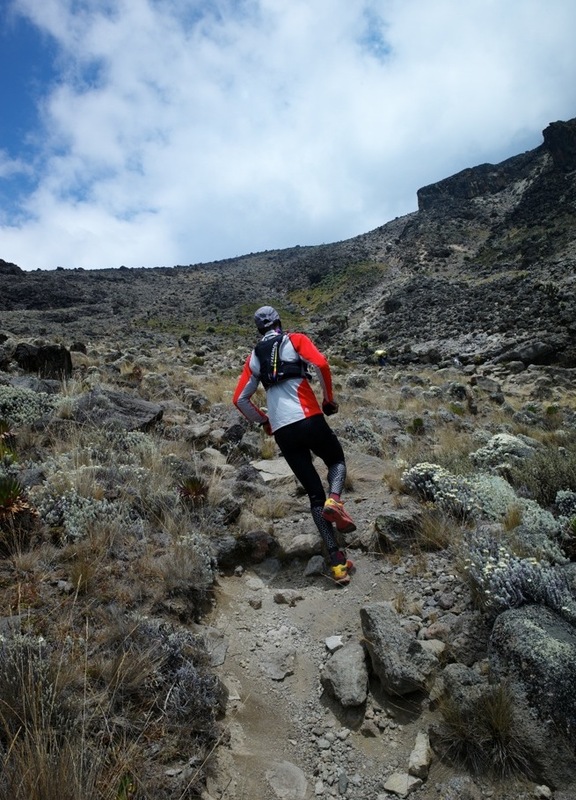 Emerge from the rocky dirt road about 200 meters below the gate and make a final jog to complete your goal. Congratulations! You have run all the way around the Roof of Africa! Enjoy the hugs, high fives, and finishing photos with congratulations all around. 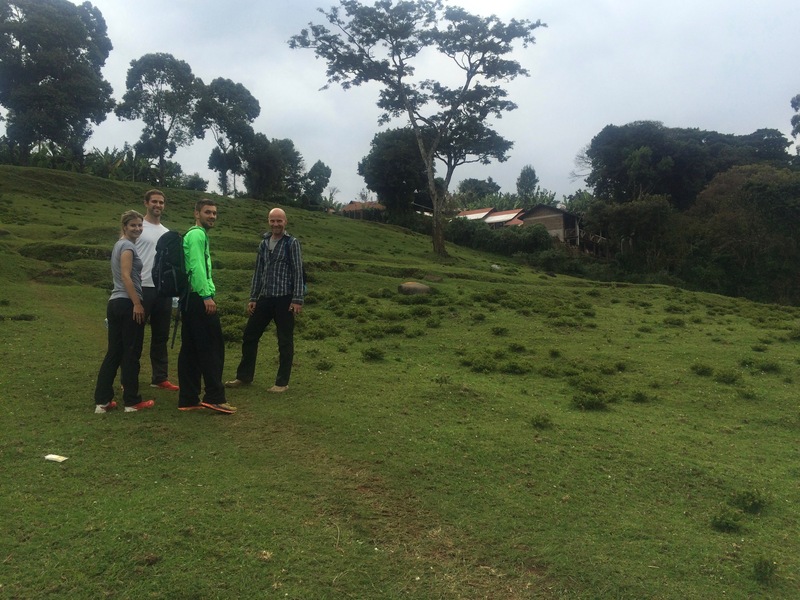 From the Marangu Gate, we walk back to the small stream on the Mtuy family farm where a picturesque waterfall is awaiting. Take the leap into the pool below the falls or just dip your exhausted feet into the refreshingly cool mountain-fed water – it’s well-deserved! Back at the farm the Mbahe crew greets you with another feast and you have the rest of the afternoon to rest and … take a hot shower! 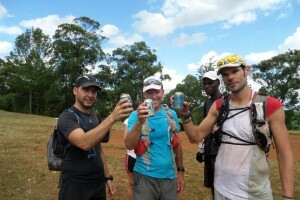 In the evening celebrate everyone’s running success with a traditional Chagga dinner of ugali (cornmeal) and a beef stew with potatoes, carrots, and cooked bananas, washed down with one, two or more bottles of the local beer (appropriately named “Kilimanjaro”).